What is Stephen King doing right? I just finished Stephen King’s “Dark Tower IV: Wizard and Glass.” This is a huge book; a mega book at 1050 pages. I’m not going to say it was the best book I ever read, but curiously enough, I found myself reading it faster than a lot of the shorter books in my “To Read” pile. I even tend to read at least five books at once, reading a chapter or two at a time and moving through them. Even while reading other books, I found myself drawn to King’s saga over and over,and felt excited each time I began a new chapter. I have to ask myself, why is that? I doubt it is his prose; King has a pretty basic bare bones kind of style, one that is slightly conversational but mostly invisible. He likes to go off on tangents (heck, most of this book is one gigantic flashback of the main character’s past), and I doubt any literature classes are praising his eloquent phrasing. Plot? I don’t see huge innovation here. In fact, King likes to draw on cliche’s, common plot devices and other books and movies, particularly in this series. Children’s nursery rhymes (like the Little Engine That Could), Wizard of Oz, even his other books make appearances. His western town is in classic western style, but with a few additions including an evil magical ball, a witch, and fog that eats you alive. So yes, there are some creative twists, and I like the way King does incorporate a lot of modern day culture into whatever book he writes. But I don’t see any big shockers when it comes to plot. So what does that leave? Characters are vital–without good characters, no reader is going to give a pile of beans for anything you have written, no matter how excellent the prose or the plot. I do think characters are an area where King excels. Take Roland. On the exterior, he’s like Cint Eastwood in High Noon–a tough gunslinger who is willing to cross any barrier, face any hardship, and kill anyone who stands in his way of reaching what he feels is his destiny, the Tower. Right from the first book, however, it soon is apparent that he has a softer side. He tries to teach the others in his group how to survive, and it isn’t solely about the quest. In this book, he is developed much further, with all the reasons for why he is the pained, hardened man he’s become. I love the other characters as well, particularly Susannah, a schizophrenic parapalegic who talks sass like nobody’s business. When thinking of King’s characters, they often stand out–think of psychotic fan in Misery, Randal Flagg, Carrie, the kid in Firestarter . . . the list goes on. So that’s one of his strong points, I would say. And the other? Suspense. Tension. When it comes to the mood that will pull in readers, this is where Stephen King is a master. Every chapter ending; hell, every line even sometimes is something to heighten the tension and pull the reader into continuing. I know this is an area I’d like to make stronger in my own works. Some examples from the book–these are all last lines of chapters. This last one is the last line of the book, so it pulls you right along towards the next book (which thankfully is already written). So we have movement even at the end, with one goal achieved and several yet to come. Another writer friend of mine gave me this advice: if you read something that really captures you, dissect it and try to figure out why. That’s how you become a better writer. Hopefully these little thoughts help me and others as well. 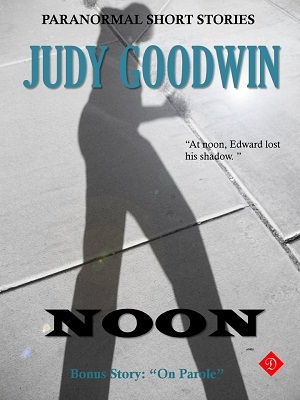 As I recover from the holidays and the mad rush to get out my fantasy novel, it seems that my KDP promotion with Amazon is about to run out for “Noon”, my short story about a man who loses his shadow. So, today and tomorrow, you get download it FREE from Amazon! Enjoy the holiday promotion! Just a little shout out to The Edible Bookshelf for today’s book blast entry: Mysteries! 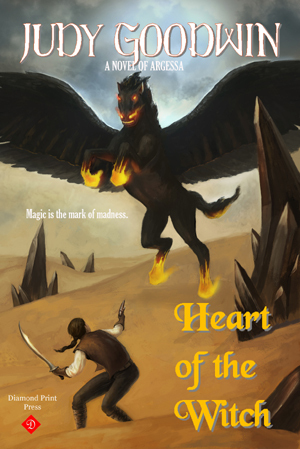 Heart of the Witch is now up for sale at Smashwords, Amazon, and soon to be at Barnes and Noble online. Buy your copy, and yes, I would love reviews! In a town struck by witch hunting fever, Zerrick Dhur holds a deadly secret. Magic stirs in his soul, and dreams call him to a mysterious woman, deep in the jungle of the newly colonized land. Driven to flee the civilized lands, he finds both friends and enemies, searching for the heart of magic. As he journeys deeper, the question remains. Will his powers lead him to good? Or to evil? Mira Terwin is the only daughter of slave trader Edmond Terwin, a man who began hunting slaves in the military outpost of Depin and has made a fortune sending them back to the Motherland, Endersey. With her father and two older brothers constantly watching over her, Mira grew up sheltered and overprotected. She spent most of her time with her Nanna, a slave woman named Moiabu who had been captured herself as a young girl. Nanna has taught Mira many of the tribal ways, including her language and the customs of her people. It is Mira’s dream to break free of the oppressive watch of her father and brothers and to stop the slave trade. Mira is headstrong, optimistic, and strong in her beliefs of a higher power which guides her. While she knows of the Mother Goddess that the Putna tribes worship, she is also steady in her faith of her own church, and sings in the choir. Men say she has a sultry voice, but Mira doesn’t consider herself attractive, with red frizzy hair and freckles. 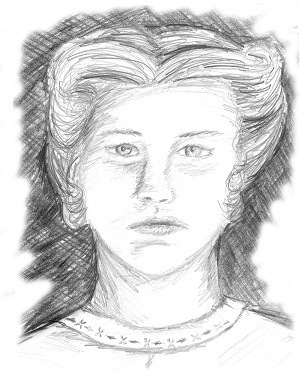 So as I said, as I count down the days to the release of HEART OF THE WITCH, I’m posting character sketches and bios. 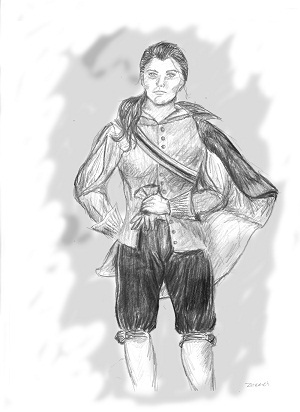 Today I’m featuring the main character of the novel, Zerrick Dhur. Born the second son of the Reverend Delwar Dhur, Zerrick has the misfortune to be gifted with magical ability in a society that burns witches at the stake. Zerrick is curious and artistic, which helps him in his understanding of the chaotic energies of magic. Unfortunately, these are not traits of worth to his father, nor his community. Letters don’t behave for him so his reading skills are poor, which is a problem in a family of clergymen. Zerrick’s secret passion is the jungle, and he desperately wants to follow the steps of his mentor and friend, Alden, who was an explorer for many years before settling down as the town herbalist. Fear holds Zerrick back; both fear of his father, and lack of confidence in himself, his abilities. He tends to keep to himself and can be moody and brooding at times. He hates his fine features, which only encourage his mother’s smothering attention. Most of all, Zerrick wishes to be free of his family and the town of Harrow.